In Kansas, state officials have so badly mismanaged the budget that they actually had to close the schools early because there wasn’t money to keep the lights on for the full school year. Governor Sam Brownback’s plan was simple. Cut taxes to the bone and watch all kinds of new jobs and economic growth roll in. Instead, the tax cuts have created an $800 million hole in the budget. So what do you do when there’s no money coming in and your state’s losing jobs by the day? 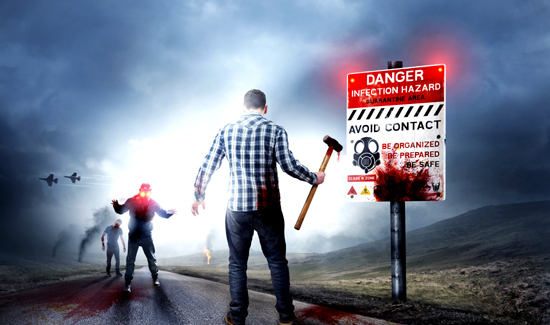 Naturally, you have a statewide, month-long zombie apocalypse drill.